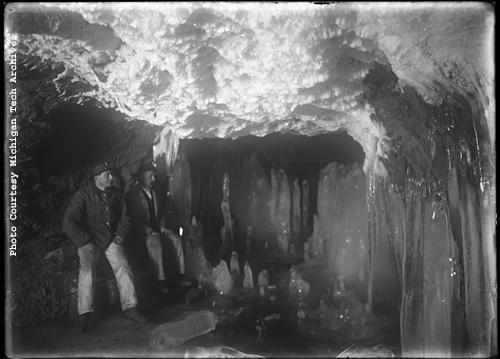 Mining engineers faced challenges in displaying three-dimensional information on underground mine workings. Technological changes in blueprinting helped transform the way engineers and labor practiced their professions. 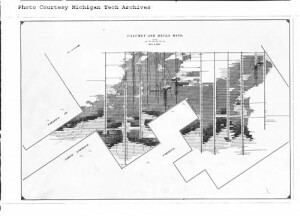 This drawing shows the extent of Calumet & Hecla's Tamarack mine in 1910. This Tuesday night, July 13, at 7 p.m., the Michigan Tech Archives Speaker Series hosts visiting scholar Eric Nystrom in Room 102 of the Chemical Science Building on the Michigan Tech campus. Nystrom will give a presentation on his research, called “Change of Plans: Blueprint technology and the evolution of engineering practice.” The advent of blueprinting technology in the late years of the 19th century gradually changed the organization, presentation, and use of visual information in the late 19th and early 20th century American industrial enterprise. Blueprints helped consolidate authority in the space of the engineering office and in the hands of upper management, enabling them to exercise greater control over work at a greater distance from the office, and changed the labor of engineering work. This change was gradual and uneven, as managers and engineers figured out how to use blueprinting to their advantage, reorganize their practices to accommodate the limitations of the new technology, and increase efficiencies in administration. Nystrom will sketch the broad contours of changes wrought by blueprinting technology, including the gradual transformation of engineering spaces, practices, and labor, by drawing on examples and artifacts from the Keweenaw and elsewhere. Nystrom is an assistant professor of history at the Rochester Institute of Technology in Rochester New York. He is working on a book manuscript about the history of underground mapping and modeling in the American mining industry. The presentation is sponsored by the Michigan Tech Archives and the Friends of the Van Pelt Library. 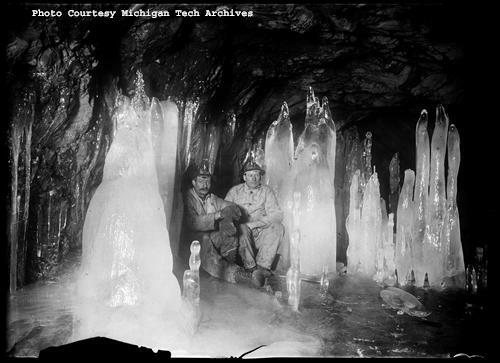 Since 1998, the Michigan Tech Archives Travel Grant has helped scholars advance their research by supporting travel to the manuscript collections at the Archives. The program is intended to encourage research using the Archives’ lesser known collections or promote new methodological approaches to well-known collections. From a competitive field of applicants, the grant committee selected four scholars this year whose research typifies the spirit of the grant program. They join the ranks of twenty-two past recipients in this most recent round of awards. 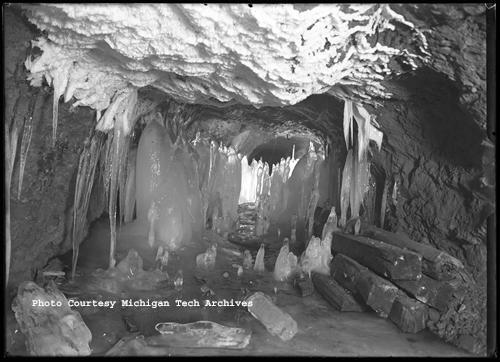 For more information on the July 13th presentation, call the Michigan Tech Archives at 487-2505. 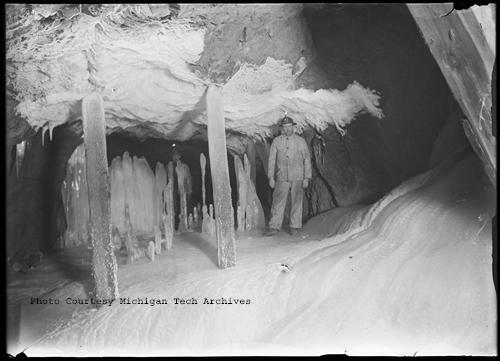 Ever wonder what is going on in the mines during the winter months? 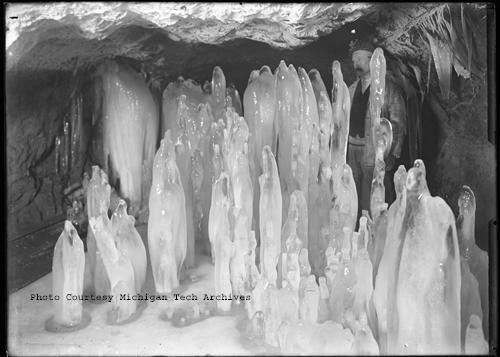 My curiosity was answered when I ran across photos of some beautiful ice sculptures only Mother Nature could make. It doesn’t get any better than that. Take a look and see if you agree. 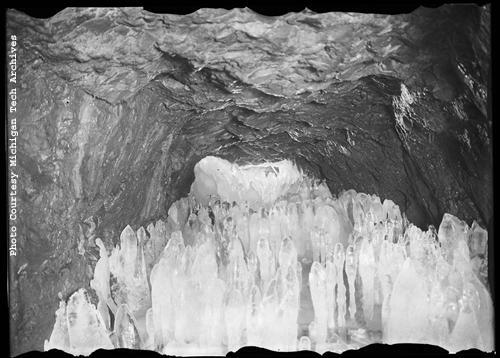 All of these photos came from the Calumet and Hecla Photograph Collection MS003 Box 12 Negative 119-21. Prints are available by request and the collection can be viewed here in the Archives reading room.